This new Compass research report presents the first Ecosystem Lifecycle model plus lessons that apply to startups and ecosystem leaders worldwide. It marks the first time the wealth of data compiled for the Global report 2015 is used to perform an in-depth analysis of an ecosystem. It also offers recommendations as to how small and medium-sized ecosystems can accelerate their growth and compete with top ones. The free complete report can be downloaded here. The startup revolution is a global phenomenon. It has taken center-stage as startups have become the primary engine of job creation and economic growth throughout the world, while large corporations continue to cut down on their workforce to compensate for the long slide in returns on assets. But as many cities struggle to join the circle of successful startup ecosystems, they face the many challenges of global competition for resources such as entrepreneurs and investors, which are attracted by the multitude of success stories of the top startup ecosystems such as Silicon Valley. The good news is a few medium-sized cities seem to have “cracked the case“ and made it to the top. With populations of 2 to 3 million, Tel Aviv’s startup ecosystem ranks number 5 in the world while Austin and Vancouver are part of the top 20—each one an impressive feat. In a real-life story of David versus Goliath, the Waterloo Region in Canada ranks #25 in the Global Startup Ecosystem Ranking 2015 with a population of only half a million. Its startup density is second only to Silicon Valley and a full 50% higher than its closest follower. How can such a small city compete against cities 10 to 30 times their size such as Rio, Atlanta and Rome? How can it be so productive and effective at developing innovative technologies and startups? Today the lessons from Waterloo are of global relevance for every stakeholder working on growing startup ecosystems and creating economic growth—from investors and business leaders to policymakers and economists. Waterloo’s top technical talent, deep sense of community, and the unmatched cooperation and coordination between stakeholders are the pillars of its success. If it can solve the challenges—shared with all lower performance ecosystems—around its startups "going global" and scaling, as well as close the funding gap, Waterloo can become an international success story. The Waterloo Region has developed a global reputation for producing top-tier technical talent—and many would say the very best. This has led to the development of a disproportionately high number of innovative technology and tech startups, along with the establishment of R&D centers by some of the world’s largest tech companies, namely Google. This feat can be attributed to the region’s institutions of higher education, especially the University of Waterloo. “Something is going on in Waterloo, because the applications we get from Waterloo students are better than those we get from students of any other university”, states Paul Graham, co-founder of Silicon Valley’s well-known startup accelerator Y Combinator in 2013. The University’s co-op program, with its students graduating with up to two years of work experience, is one of a kind. In combination with a strong entrepreneurial mindset, its graduates are the second most frequently hired in Silicon Valley, behind Stanford. The ecosystem’s performance is also due to Communitech, an innovation center that acts as active coordinator of the ecosystem. It offers accelerator programs, space for startups and other organizations to locate incubators, and informal and formal mentorship programs. The Waterloo Region has many achievements to be proud of, yet its Performance Index falls short of the world’s top 20 for both Ecosystem Value and Output (number of startups). Also, its Growth Index of 2.4 is only slightly above the global average of 2.35 (on a 10-point-scale with Berlin, the world’s fastest growing ecosystem, at 10). Why are these metrics important? Research conducted for the Global Startup Ecosystem Ranking 2015 has established that bigger is better when it comes to startup ecosystems. More startups, resources, and experience lead to higher Startup Performance and the generation of larger exits. These in turn attract more investors, entrepreneurs, and talent to the ecosystem, accelerating its growth, in a virtuous cycle of success. Appropriately, leaders and policymakers of small and medium-sized ecosystems are asking “How can an ecosystem trigger this virtuous cycle in the first place? How can we accelerate our growth?" The answer differs for ecosystems at every stage of development and Compass’ three-year research into these questions has led to the creation of a lifecycle model that structures the problems and the solutions. Note: we introduce the first Startup Ecosystem Lifecycle model in the report (download here). Startup ecosystems develop first through the Activation phase by “Catch Up Growth”, increasing the productivity of their organic (local) resources by attracting know-how through interactions with stakeholders from the world’s best ecosystems. During this phase local stakeholders increasingly learn and use global best practices specific to tech startups such as Silicon Valley style venture financing and Steve Blank’s Customer Development methodology. Once an ecosystem has maximized the use of its organic resources through best practices it has achieved what Michael Porter would call the productivity frontier. Few startup ecosystems around the world have reached that state. Therefore they start producing more and larger exits than other ecosystems in their state, region or country. These exits act as the trigger that graduates the ecosystem to the Integration phase. From here, its growth accelerates to an inorganic rate as external resources (entrepreneurs, talent, and investors) start moving to the ecosystem from all over the region or country—and, if it produces several internationally exciting exits and unicorns, from all over the world. It has become a pole of attraction for startup resources. Over time an ecosystem grows to a larger size than was possible from its organic resources only. It enters the Maturity phase as its relative growth, calculated on a larger and larger denominator, inevitably slows down. This model is useful to guide ecosystem leaders and policy makers towards actions that further an ecosystem’s growth at each phase of development. For ecosystems in the Activation phase, Compass’ upcoming Hong Kong Startup Ecosystem Report will provide recommendations on how to further their development and growth. 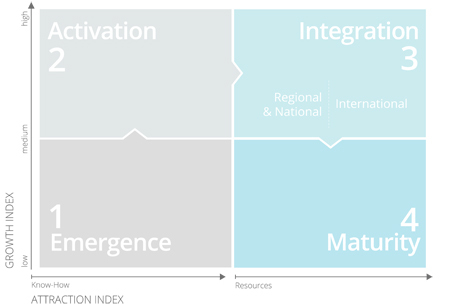 According to the Ecosystem Lifecycle model, Waterloo’s Growth & Attraction Indexes suggest it has reached the Maturity phase. More specifically, it is in the upper end of that phase in terms of growth and in the “Regional & National” Attraction section. From both the Integration or Maturity phases, the central goal of ecosystems plateaued in the Regional & National Attraction segment must be to create the very large, internationally exciting exits that trigger the ecosystem to become an international pole of attraction for resources. To achieve that objective, the core issue they must address is Startup Performance. Waterloo and other Canadian ecosystems are a good case study from which to examine ecosystem problems and the corollary recommendations. Figure 2 and 3 clearly show that the performance of Canadian startups, as captured by their valuation growth rate, is much slower—63% slower—than for startups in top ecosystems. This slow valuation growth is an underlying factor leading to the small number or absence of large exits and unicorns. This issue is shared across lower performance ecosystems: for instance Austin, ranked #14 in the 2015 global ranking, sees its startup valuations grow 62% slower than Silicon Valley’s. Two key factors contribute to the lack of large exits and unicorns in Waterloo and other Canadian ecosystems, and they are common problems in underperforming ecosystems. First, startup valuations grow more slowly because revenue growth is much slower. The root cause is a Global Market Reach gap, centered around customer development (as defined by Steve Blank) and growth. It is generally accepted—and emphasized by investors—that the goal of startups is to scale rapidly and seek a dominant market position, if not a monopoly, especially if a product or service is characterized by strong network externalities and therefore subject to a winner-take-all end game. In order to achieve this goal startups must be globally-focused from the onset which, in practice, is best achieved by prioritizing the U.S. market. As Reid Hoffman puts it (in Wired), the secret of Silicon Valley success is not the startup. It’s the scale-up. Because the U.S. market is less than 100 miles away, one would expect Waterloo startups to make extensive use of the opportunity to focus on the U.S. market and enter it earlier than startups in geographically distant ecosystems. However, on average only half of Waterloo startups' customers are foreign versus 74% for Tel Aviv, which is a non-U.S. ecosystem with higher Startup Performance. Tel Aviv startups tend to go global from day one. Figure 4 sheds further light on this matter by showing that the proportion of globally-focused startups (defined as having more than half of their customers based outside of their local country) in Tel Aviv is 14% higher than in than Waterloo and 10% higher than in the top three Canadian ecosystems (Montreal, Toronto and Vancouver). The level of global focus has an acute impact on the revenue growth of startups. Figure 5 shows that globally-focused B2B startups from all over the world see their revenue grow 2.1 times faster than others. Figure 6 shows the relationship between foreign customers and revenue growth holds true for Canadian startups as well. In practical terms this means that focusing primarily on business customers in Toronto—one of the most economically powerful cities in North America—leads to lower Startup Performance. Interestingly, however, while globally-focused startups from all over the world (except U.S. and Canada) see their revenues scale more than 110% faster than non-globally-focused startups, globally-focused Canadian startups only grow 60% faster. In other words, Canadian startups do not reap as much benefits from choosing to focus on global rather than local customers as startups from other countries. How could that be? Interviews conducted with startups and experts from all over the world revealed that Canadian startups attack the U.S. market in a different, less effective fashion. Partly because they benefit from a shared language and being so close to large U.S. cities, and partly because of the lower cost of doing so, Canadian startups almost always make the decision to attack the U.S. market from Canada. They build the foundation of their sales, marketing and business development teams in the Canadian headquarter and, while they may hire some Americans or Canadians living in the U.S., those teams are managed by Canadian executives. Canadian startups can learn from startups from Tel Aviv and other higher performing ecosystems by building their sales and marketing teams directly in the U.S. around experienced U.S. executives and employees bringing business culture, process knowledge, and valuable relationships with and/or to customers and partners. While increasing their cost of U.S. commercialization, the net benefits will lead to the larger, faster exits that have eluded Canadian startups and constitute the main impediment to the acceleration of the ecosystem’s growth. The second factor contributing to the lack of large exits in Canadian ecosystems and, generally, in other lower performance ecosystems, is a local Funding gap. Most importantly, a dramatically lower proportion of startups are obtaining seed funding from private investors. Figure 7 shows the proportion of startups funded in different ecosystems compared to Silicon Valley (represented by 100%). Leading U.S. ecosystems are close to Silicon Valley. 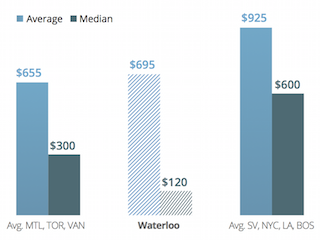 The Waterloo, Toronto, and Vancouver ecosystems fare a lot worse. Throughout all rounds the proportions of their startups getting funded represent a maximum of one-third of that for Silicon Valley. Because the attrition rate across rounds is higher in top Canadian ecosystems than in Silicon Valley, this seed funding gap translates into much fewer Canadian startups receiving Series A and Series B funding–five to nine times fewer. When compared to the average proportions for New York, Los Angeles and Boston, about three to five times fewer Canadian and Waterloo startups receive funding at each round. Austin’s performance, close to the average for New York, Los Angeles, and Boston, confirms the lower proportion of seed funding events in those Canadian ecosystems is not inherent to smaller ecosystems. These results are in sharp contrast with expert statements (and data) saying that a) the quality of ideas coming from Waterloo is higher than in other ecosystems, and b) the quality of technical talent is among the very best in North America. Waterloo produces better business ideas and higher quality technical talent, yet fewer startups get seed and Series A funding. All of this points to an important Funding gap, and this is further underlined by the examination of median and average funding events (see Figures 8 and 9). Waterloo and Canadian startups receive smaller amounts of funding at seed and Series A rounds than U.S. startups. 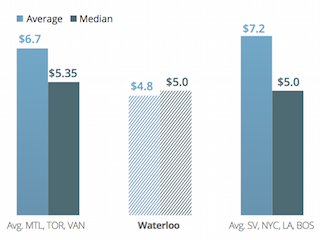 For seed rounds Waterloo startups raise average and median amounts that are 25% and 76% lower than those in the top four U.S. ecosystems. This underlines the serious local funding gap for seed rounds. For Series A the gap is less important, with the average being 33% smaller for Waterloo but the median being the same. However a regression analysis reveals that Waterloo startups get $2.5 million less if they raise a Series A round only with locally investors rather than include at least one foreign investor. This confirms the local funding gap for Series A. It is worth noting however that the lower software engineer salaries in Canadian ecosystems, which is less than half of that in U.S. ecosystems, compensate for the lower Series A amounts, and partially compensate for the lower seed round amounts. This is often the case in non-U.S. ecosystems. Note: The full report greatly expands on these and other recommendations (download here). Key lessons for startups in small and medium-sized ecosystems like Waterloo start with focusing customer development activities on foreign customers and global market needs and by building a growth team organically in the selected foreign market. This can mean targeting U.S.-based businesses using experienced American sales and marketing people who bring their contact lists, existing relationships, adapted work processes, and culture. Actions such as these can be executed by startups themselves. Other actions require the consensus and coordinated efforts of ecosystem leaders, policymakers, and other stakeholders. Together they can work to support their startups in “going global” by activating their international communities and funding growth-focused hubs and programs based in the U.S. and managed by people with deep startup experience. Drawing from successful policies executed in other ecosystems, policymakers can help solve gaps in seed and Series A funding through matching funds and tax credit programs dedicated to one type of round and investing as LPs in local funds and foreign funds willing to open offices in the ecosystem. An additional dimension to the solution calls for integrating nearby cities into larger, globally competitive startup ecosystems like San Francisco-San Jose or London-Cambridge, both of which successfully mitigate their similar geographic distance through common transportation solutions including trains and buses. As importantly, stakeholders would have to truly integrate their activities, and later, their communication, so global startup communities consider it a truly integrated corridor. For instance, a combined Toronto-Waterloo ecosystem would be more attractive to both national and international entrepreneurs and investors, helping solve the scaling and funding gaps. Combined with Waterloo’s top technical talent and its outstanding productivity in creating innovative technologies and startups, addressing these issues can lead to the production of large exists and unicorns, in turn attracting the international entrepreneurs, capital, and other resources that are needed to grow the ecosystem at a faster, inorganic growth rate. More importantly, it could propel the region to become an even bigger engine of economic growth and job creation. Please help us spread the word: via Twitter (click-to-tweet) & Facebook.